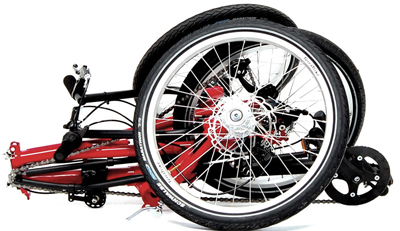 The TerraTrike Traveler builds on the outstanding Rover frame design, giving an inexpensive and super-compact folding trike. So first we had the Rover with its innovative, simple and purpose-based design. Then they came out with the Rambler to realize the design in a lighter and more elegant manner, but they lost the transportability. So they made a folding version of the Rambler and called it The Traveler. 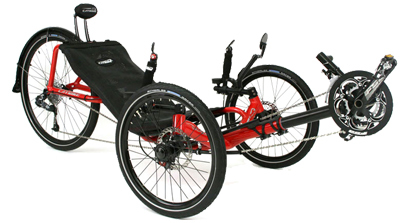 Not only is this the lowest-cost real folding trike that we offer, it is also the most compact folder. 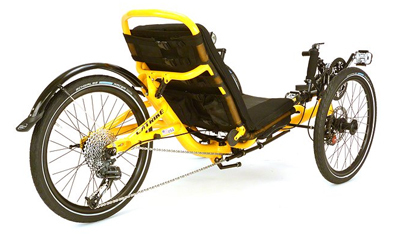 On most folding trikes, you take off the seat and then fold the rear section over the front. 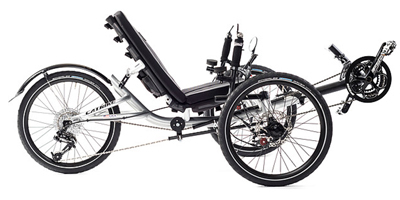 The Traveler is no different, but you can also quick-disconnect the steering rod and fold in the “wings” or the crossmember out the front wheels. 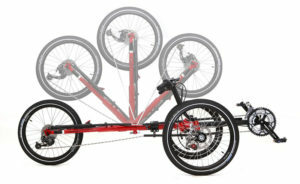 No other folding trike does this. You can even get a canvas bag that the folded frame drops into and strap it over your shoulder, making the whole thing disappear. When customers bring up the matter of transporting a trike on public transit, we point out that the trick to boarding a bus with a trike is to make it not look like a trike. If it just looks like a bag then no one hassles you. The Traveler comes in the same choice of component specs as the Rambler, but is $300 more. 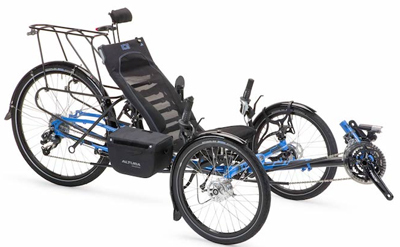 We stock it with the excellent NuVinci N380 hub, that is so well matched to this series of trikes. Remarkably, TT preserved the 300# weight capacity from the Rambler. While the frame will accommodate the Rambler All-Road wheel upgrade, it won’t fold up with the larger wheels on it. 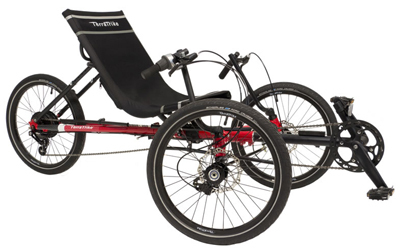 A trike you can take almost anywhere… The Traveler is a folding trike designed to be compact and portable, while still retaining the quality and comfort that make TerraTrikes such a joy to ride. Imagine taking your favorite ride with you on vacation, packing it in the camper or just being able to store it in a closet; the possibilities are endless. In the same amount of time it would take you to remove a bike or trike from a car rack, you can have the Traveler unloaded from your car’s trunk or back seat, unfolded and ready to ride. The frame hinges have been designed to be both easy to operate and flawlessly secure. The Traveler is the best solution for anyone who needs to save space without sacrificing performance or comfort. It will quickly become your favorite way to explore the world, no matter where your travels take you. The Traveler isn’t just one of our other models with a hinge slapped on it. It was developed from the ground up based on time-tested design parameters. 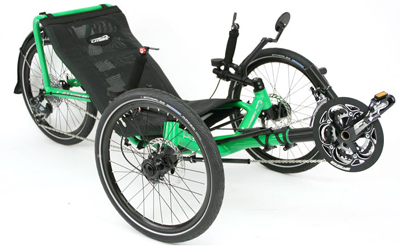 We then added the same high quality components and materials as our other models ensuring that the Traveler can be both a trike you take on vacation and your everyday ride. Internally geared drive systems are heavier and more expensive, but simple, robust, reliable and user-friendly. Instead of moving the chain between different sized sprocket all the shifting is done in a gearbox inside the rear hub. A n380 hub has about the range of 380%. This is like a bike with one chainring and a 11-42 11-speed cassette. But it doesn’t have discreet gears. You can dial the gear ratio to exactly what you want within that range. For comparison, a Shimano Alfine-11 hub, like we recommend for the Rover Tandem, has a 408% range at $100 more than the N380. A Rohloff Speedhub, the most “wowser” of all internally geared hubs, has a range of 526% for a gazillion dollars more. Derailer transmissions typical to recumbents (front triple, rear 9-10 speed) have ranges of about 575-625%. FYI. Comfort Straps are stirrups that hold your heel. You will want some sort of foot retention on a trike. This is the size of the sprocket on the back. We can resize this easily and inexpensively to move your gearing range higher or lower. Single wall rims are lighter but not as strong as double wall. If you are really heavy we’d recommend upgrading to double wall.